In this installment of the Pyramid Rating System’s All-Time league, we’re going to look at how the 2017 season affected the composition and rosters of teams. How much difference does a year make? Well, that depends. For less established teams like the Rays, one year can make a significant difference in their standing. I’ve included how I had each player rated during the 2017 season on a scale of 20-80 meant to mimic the scouting scale major league scouts use. Here are the roster changes as affected by the 2017 season. It’s rare for an established team like the Red Sox to have a player make the 40-man roster after just four years, but Betts takes over the spot previously held by Hall of Famer Harry Hooper. With 161 games played in center field, Betts should meet the defensive requirements to maintain his status to play there and is now within striking distance of challenging Fred Lynn for the starting center field job. Another season like Betts has had over the previous two and the Red Sox will have a new all-time starting center fielder at the end of the 2017 season. What can I say about Scherzer? Last year, he cracked the starting rotation following a Cy Young season, but in this league having just one Cy Young doesn’t get you much and Scherzer would have been viewed as a somewhat overmatched No. 3 starter on a rotation seriously lacking in depth. Adding a second Cy Young and even just three years with the team is enough to move Scherzer from below-average No. 3 starter to solid No. 2. No team has added more depth in one area since I started doing this series than the Nationals have added to their starting pitching. The No. 1 starter in the rotation, Walter Johnson, may be the favorite to win the AL Cy Young award in this all-time league, but back in 2015, there was little else positive to say about this starting rotation. No longer is that the case, with González having a season that hearkened back to his 21-win campaign in 2012. González may still not be the most desirable option to have in this league as a No. 3 starter, but his addition means the Nationals will be that much less dependent on their Senators lineage for starting rotation depth. Once again, the Nats’ pitching staff, previously a major weakness on this team, adds depth with Strasburg finally having the type of season in 2017 that many expected of him when he was the No. 1 overall draft pick in 2009. He still needs another year or two to crack the rotation, but if he were able to produce in 2018 as he did in 2017, I would expect to see Strasburg as a back-end rotation starter. New Role: Nationals’ starting second baseman. It’s surprising that Rendon has yet to be named an All-Star team. Even though he has shifted full-time to third, he has still plenty of appearances at second base to qualify for the position. Rendon takes the position previously held by Buddy Myer, who may be a former batting champion but does not provide much power. 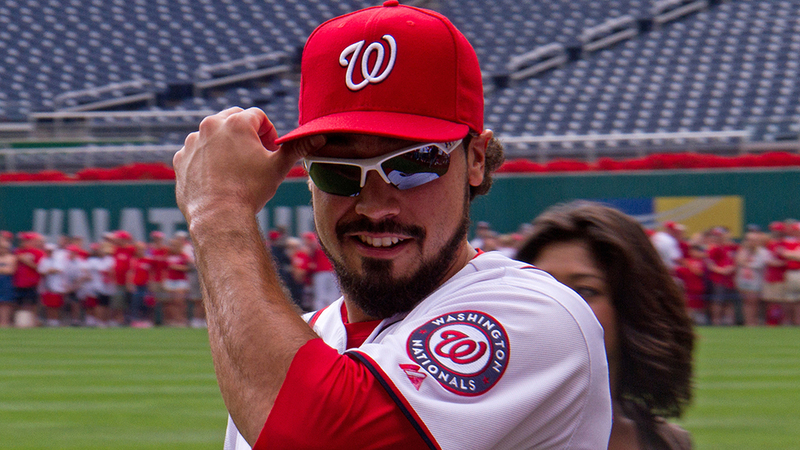 Rendon has established himself as one of the premier third basemen in baseball, finishing in the top 10 in OPS in 2017 and posting his first 100 RBI season. Rendon will still be seen as a below-average second baseman. but does present an upgrade over Myer that will continue to grow over time. Arguably the best starting rotation in the American League gets even better with the addition of two-time Cy Young award winner in Kluber. Kluber joins a staff that already featured four Hall of Famers but will now have three. With Kluber joining the rotation combined with some revaluation of the ranking system, Gaylord Perry is off the Indians and onto the San Francisco Giants where he will be the No. 2 starter. Taking over Kluber’s spot on the Indians’ 40-man roster will be Bartolo Colón, who was previously on Oakland’s 40-man roster. Taking over his spot on the A’s will be Trevor Cahill. A reliever is the one position where one great season can be enough to crack a 25-man team, and that’s just what Knebel did last year, finishing the year with a 1.78 ERA, leading the NL in games pitched and finishing in the top 10 in saves. That allows Knebel to take over a setup role previously held by Dave Jolly. Jolly will be sent down to the 40-man roster, which in turn forces Mike Fetters off the team. Cain may no longer be a Royal, but he finished his Royals tenure strongly in 2017, batting .300 and finishing in the top 10 in the AL in WAR. Along with his performance in previous years, that is enough to put him over Hal McRae on the 40-man squad and give Kansas City a solid fourth outfielder capable of playing all three positions. He was my pick in the Hardball Times Franchise Player draft and this is a big argument why. As you can imagine, with the Cubs you need to be a borderline Hall of Famer just to garner consideration. Ten-year team vets like Randy Hundley don’t come close to making the team. That said, Kris Bryant is on that track. I look at Bryant as the total package of what you look for in a franchise player. We’ll see if he can make this team as a starter, but he’s already in consideration to take over the bench role held by Stan Hack, and Bryant’s ability to play left field makes him a much more attractive bench option. For now, Bryant takes over a 40-man spot previously held by Heinie Zimmerman, a 10-year Cubs veteran and triple-crown winner. Before the 2017 season, I had Votto sitting against lefties with the hard-hitting Tony Pérez seeing action against righties. This made for one of the best platoons at a position across either league, with a Hall of Fame-caliber hitter batting from each side of the plate. But last year, Votto led the National League in OPS for the second time, and as great as Pérez was, even with a lefty-righty match-up in his favor, I can’t justify benching Votto. I still won’t be shy about benching Votto for some rest against righties and Pérez will make for a fearsome pinch-hitter as well as seeing more action at third base. But Votto is now on par with Hank Greenberg for first basemen in this all-time league, and he can still get to Jeff Bagwell level or even better. 2017 may have been Ray’s only meaningful season with the Diamondbacks to date, but for a team with zero depth, his addition allows the Diamondbacks a little bit of breathing room. In spite of their age, the Diamondbacks can field one of the best starting rotations in baseball, headlined by what will be graded as a four-time Cy Young award winner in Randy Johnson. He would be my pick to win the Cy Young in the National League if the season were to be played out in full. This situation is like Robbie Ray’s. A player with effectively one year helps a rotation with little to no depth. It doesn’t improve the team much, but it does give the D-backs a bit of a cushion they otherwise wouldn’t have. Combined, Ray, Bradley,and Corbin will take up spots previously held by Brian Anderson, Doug Davis and Wade Miley. The Diamondbacks won’t improve much yet, but if the three can follow up with the same performances in 2018, the Snakes will some back-end depth to add to the big trio of Johnson, Curt Schilling and Brandon Webb. It’s going to be odd to think of Craig Biggio as a full-time starting catcher for the all-time Astros, but with no real reliable catching options and a now MVP winner in Altuve on the team, there’s no justification to have either on the bench. Biggio might not be much defensively, but he will be nearly as good as any catcher offensively, while Altuve will now be a dark horse all-star candidate whose outlook will only improve as he gets into Hall of Fame discussion territory. I would like to say that the potential held by Dickie Thon is now beginning to be fully realized by Correa, but with all due respect to Thon, I don’t think he was ever going to be as good as Correa is already. Thon wouldn’t break out until he was 24, while Correa enters this season still just 23 years old. What was once a weak point of this Astros team is now on track to becoming a strength for a team that already has plenty. Combined with their deep bullpen and a solid starting rotation, the Astros may be the most complete team in the National League West. Seager may have played just two years, but aside from Maury Wills no other LA Dodgers shortstop has been more dominant than Corey Seager. If Seager can add a third Silver Slugger award, he will begin to challenge Maury Wills for the starting role and give the LA lineup some much-needed offensive firepower. After falling out of the Indians’ starting rotation due to the emergence of Corey Kluber, Perry is essentially traded to the team he is better known for and where his talents can be more appreciated. Although Perry does rate slightly worse with the Giants than he does with the Indians, he still ranks as one of the better starters in either league. His arrival will bump Tim Lincecum and Matt Cain down in the rotation from No. 2 and No. 3 starters respectively to the No. 3 and No. 4 spots, while Madison Bumgarner will keep his No. 5 spot. Jason Schmidt who is now the team’s spot starter. John Montefusco, who held that role, is now on the 40-man roster, taking over the spot previously held Bob Knepper, who is no longer on any all-time team. Once again, the most improved all-time team appears to be the Washington Nationals. When I started this series, the Nationals’ starting rotation consisted of Walter Johnson and not much else. But now the Nationals are following up Johnson with arguably the best pitcher in baseball today in Scherzer and some other decent pitching that can still improve significantly in the next few years. They’re still not at the level of the Red Sox or the Yankees, but they’re not that far off. Johnson will rate as the best pitcher in the league, with all 21 of his Hall of Fame seasons coming in Washington. Few were as dominant as Johnson was at his peak and none lasted anywhere near 21 years with a single franchise. In the National League, the big winners were the Astros and the San Francisco Giants. The addition of Gaylord Perry to the Giants goes a long way in closing the starting pitching gap between them and the Dodgers, while current 25-man roster members Buster Posey, Brandon Crawford and Madison Bumgarner continue to add to their résumés. For the Astros, the backbone of their World Series-winning squad gives what was once a dark horse team a significant push toward being a serious World Series threat in this all-time league. The third base situation still leaves much to be desired, but there’s no other position where Houston doesn’t rate at least average, including starting pitching and bullpen. The Dodgers also show some slight improvement with Kenley Jansen and Clayton Kershaw improving their standing with increased tenures in addition to picking up Corey Seager. Kershaw, in particular, is now close to being on par with Pedro Martínez and Greg Maddux and putting himself into Cy Young conversation. I think Betts is a very good player, but Fred Lynn and his 308/383/520 920 OPS 141 OPS+ 124 home runs, 521 RBI, 6x All Star, 4x GG is more than 1 season from getting displaced by Mookie Betts’, 292/352/488 840 OPS 121 OPS+ 79 home runs, 311 RBIs, 2x All Star, 2x GG as the Red Sox all time center fielder. This system tries to dial in on how dominant players were at their best. The best year DiMaggio ever put up in terms of WAR was 5.1 in 1942 as according to baseball-reference WAR which is what this system uses. As great as DiMaggio, he was never the caliber player that Betts has been over the last several years and probably will continue to be. Always loved reading the Pyramid Rating System articles. Happy to see another one to start the year. Thanks. Been a busy offseason for me both with making changes to the Pyramid Rating System and personally, but things are finally squared away at least relatively and I promise it will not be several months until my next article is out. sure would be nice to see a Blue Jays rating sometime this year. Glad to see another one of these, Paul! I was worried it wasn’t going to be continued. Ever since you started I’ve been eagerly awaiting the Detroit Tigers. In facts, that’s about all I have to look forward to as a Tigers fan nowadays! It seems like they’ll have a very strong team. Thank you for doing these! This right here is why I love this web page. UK Essay Writing Service I’m finished speak me about the slow marketplace, possible work stoppages, collusion, and gamers misreading the marketplace. allow’s get a few facts and speak about the game again, thanks.